Delicious and easy to make, this Blueberry Cobbler is great for weeknight desserts or casual gatherings. Serve the cobbler warm with vanilla ice cream for the perfect summer treat! This simple Blueberry Cobbler recipe was inspired by my friend’s blog post of a Rhubarb and Raspberry Cobbler. But since I had no rhubarb or raspberries available at home, I decided to make it using fresh blueberries. It turned out wonderfully, a perfect light and fruity summer dessert. I find lemon complements blueberries nicely, so I decided to add a bit of lemon juice to the blueberry filling mixture and a bit of lemon zest to the biscuit topping. The lemony flavour in the baked cobbler was delightful and added the perfect touch. I loved the use of cornmeal in the biscuit as it added texture and gave a nice little crunch to the topping. I thought the amount of biscuit was perfect to make this a light dessert but if you prefer a thicker topping, you will need to adjust the recipe (I think time and a half would be perfect, but it may be simpler to just double the ingredients for the biscuit topping). The Blueberry Cobbler is only lightly sweetened. If your blueberries are sweet then the amount of sugar in the recipe should be enough, if you find your blueberries are a bit more on the tart side, then you may want to add an extra tablespoon of sugar. 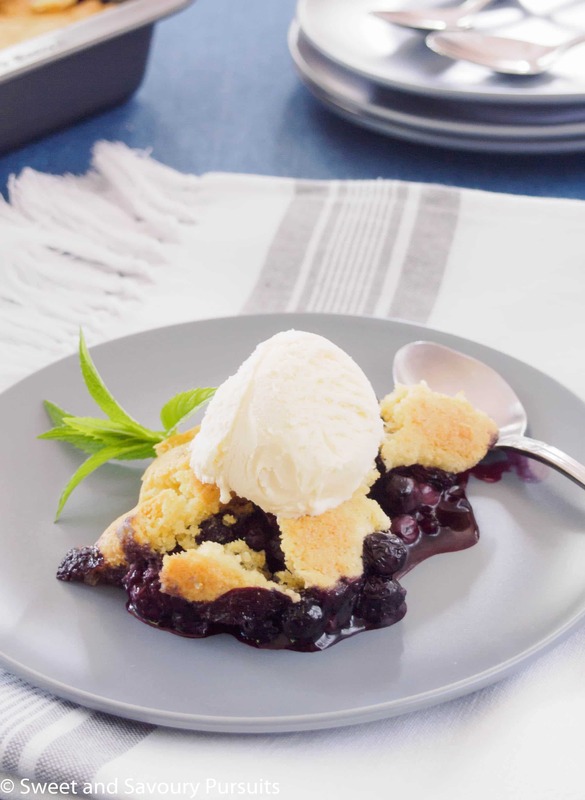 The best way to serve this Blueberry Cobbler is still slightly warm with a scoop of vanilla ice cream or maybe some lightly sweetened freshly whipped heavy cream. Enjoy! Position rack in centre of oven. Preheat oven to 350°F. Wash the blueberries, drain and add the sugar, lemon juice, lemon zest, and cornstarch, mix well and set aside. In the bowl of your food processor, add the flour, cornmeal, sugar, baking powder, salt and lemon zest. Pulse a few times until mixture is combined. Add butter, and pulse until it resembles coarse meal. Pour in the cream and continue to pulse until the dough comes together. Turn the dough onto a lightly floured surface and pat it together, divide the topping into several dough balls. Scrape blueberry filling into a 8 inch square baking dish, spread blueberries evenly in the pan. Top the blueberries with the biscuit dough balls, making sure to spread each ball out as to cover most of the blueberry filling. Brush the top of the biscuits with a bit of heavy cream. Bake for approx. 25 min or until the biscuit is nicely golden on top. I love cobbler! But I’ve never tried cornmeal in my cobbler before. I have to try this sometime! I hope you do, it’s really delicious! I love all things blueberry but I have never made them into a cobbler for some reason. Thanks for the inspiration. 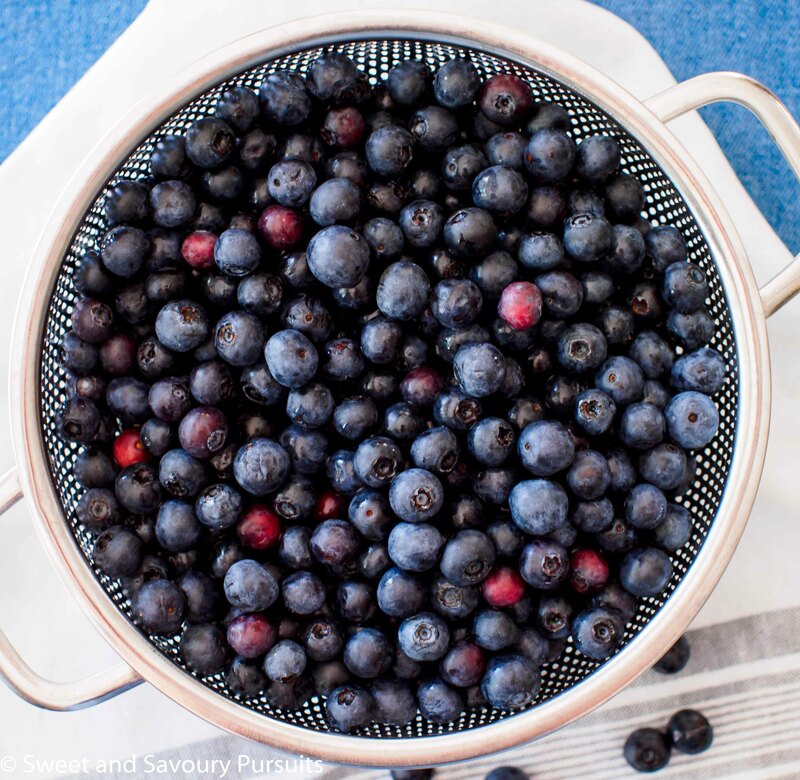 You have some beautiful photos of blueberries in this post! I’d love to try a piece of the blueberry cobbler yum! Thank you Sia, that’s so kind of you to say! This look so yummy that I pinned it! You are inspiring me to try this dessert with different fruits this summer. This cobbler looks delicious! I love all of our beautiful fruit right now and all of the great bakery ideas. Thanks Julie, so do I, there are so many desserts that can be made with fresh fruit, and much more delicious when we can get the fruit locally. Glad to have been an inspiration, Fida! I just love cornmeal in a cobbler biscuit, and as you have reminded us, any fruit works well. This looks delicious, and the blueberries make for a very striking photograph. Thank you Louise! I’m looking forward to trying even more variations of this recipe. That’s wonderful Angie, hope you enjoy it! Oh my goodness, yes it is. I was tempted to make a cherry one today! Thanks! 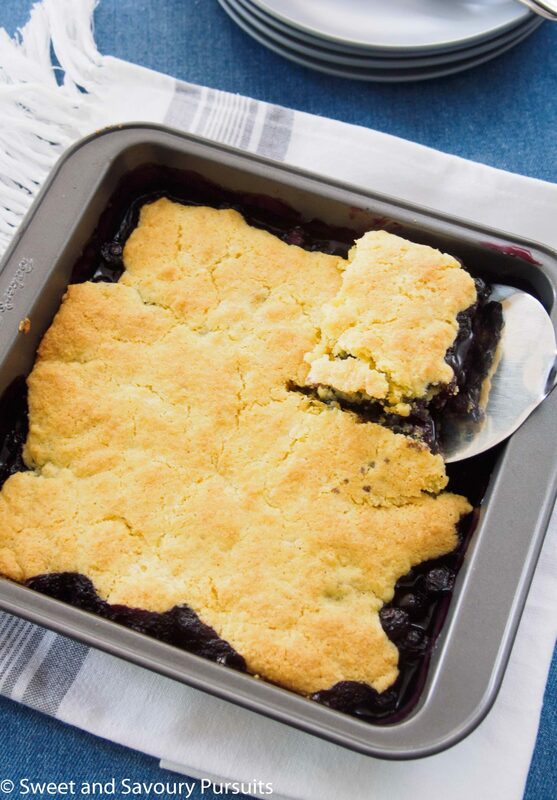 Blueberry Cobbler is one of my favorite desserts! Yours looks wonderful!